How far back does the history of Secessionism go? To the 1850’s? The 1830’s? 1820’s? As we saw in part II, there was a secessionist movement during the War of 1812, one which had nothing to do with slavery. But the earliest Secessionist movement goes farther back, back in fact to before the Constitution, to the early days of the Republic. Historians of the early Republic are quite familiar with the so-called Western Conspiracy (sometimes referred to as The Spanish Conspiracy) but it is rarely, if ever, connected with the greater narrative of the road to secession and Civil War. In truth, there was more than one separatist movement in the years immediately after the end of the Revolution, some more serious than others. In 1782, the Thirteen Colonies, united together as the Continental Congress, signed a peace treaty with the English Crown and the United States officially became a country—but not a nation. Wary of the way the King of England and his Parliament had tyrannized over the colonies, the newly independent states united in a loose union, called the Confederation. What had been the Continental Congress now became the Confederation Congress and while it had some powers, the thirteen states retained a great deal of autonomy and authority. On the other side of the Appalachians, the frontiersmen enjoyed a great deal of freedom, but they also felt abandoned by the states they were technically part of. Indian tribes, encouraged by both the English and the Spanish raided the settlements at will; more importantly, transporting their crops and other goods to sell at market back east across the mountains was difficult and costly. It was far easier to build flatboats from lumber, load them with crops, meat, whisky and other goods, float them downstream and sell them at Spanish New Orleans. But the rub was that Spain claimed the same western territories that the United States did and after a few years began to tighten the screws on the frontiersmen, closing off the Mississippi to trade. Of course, depending on the custom official in charge at Natchez, a well placed bribe or two could grease the wheels of commerce and allow a flatboat pass downriver. In New Orleans, the Spanish governor was also eminently bribable. The goal of the Spanish government, however, was to wean the frontiersmen away from the new Republic and become subjects of the crown. 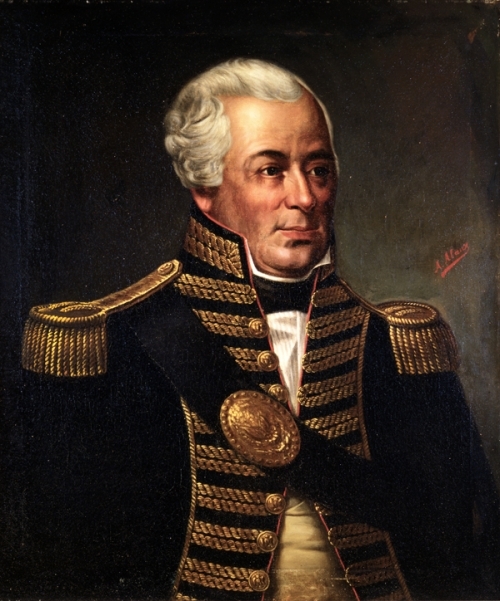 General James Wilkinson, who later became Commander in Chief of the US Army, was heavily involved in plots with the Spanish. Frontier leaders were encouraged to pledge their allegiance the Spanish Crown; among their number we know were James Wilkinson of Kentucky, who later became the head of the US Army; another frontier leader was none other than Andrew Jackson in Tennessee; General James Robertson was also in contact with the Spanish. How many frontier leaders were in collusion with the Spanish is unknown; in later days, many of those who had been involved became prominent politicians and military leaders, and their dalliance with the Spanish an embarrassment, so much evidence regarding their collusion and secessionist activity was suppressed. 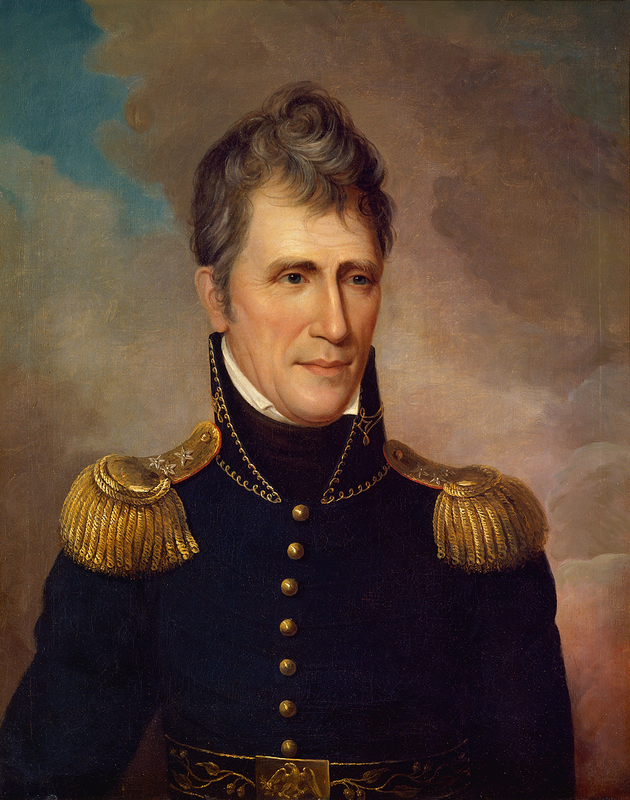 Andrew Jackson, in his earlier career, had signed an oath of loyalty to the Spanish government and was involved in the Western Conspiracy as well in the 1780’s. The weakness of the Confederation government extended far beyond the danger of the western territories below the Ohio being taken over by the Spanish; in the Northwest, the British had never abandoned their chain of forts, both to protect the fur trade with the Indians and also as bases of operation for the Indian tribes to raid the American settlements. The British had hopes of retaining the Northwest despite treaty obligations; when the Confederation fell apart, parts of the United States would be ripe for the plucking—or so His Majesty’s government hoped. 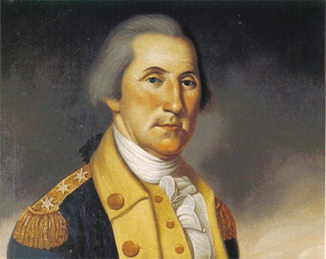 While George Rogers Clark was not involved with the British, he did enter into a conspiracy with the French Revolutionaries in the 1790’s to invade British territory from the Northwest Territory, which President Washington took a dim view of. On the northern frontier with Canada, Ethan Allen, the hero of the Revolution, also was part of the Republic of Vermont, organized in 1777, which had a running dispute with New York, which considered Vermont part of their state. In the 1780’s, Allen and others in Vermont undertook negotiations with the British governor of Quebec, with a view to establishing Vermont as a British province. During Shay’s Rebellion in western Massachusetts in 1786, Daniel Shay offered to make Ethan Allen “King of Massachusetts” but Allen turned him down. Ethan Allen, hero of the Revolution, was part of the Republic of Vermont and was later offered to be “King of Massachusetts” by Daniel Shay, during Shay’s Rebellion. As with the western territories, the weakness of the central government under the Confederation had a lot do with Ethan Allen and his compatriot’s secessionist movement; unlike the Trans-Appalachian secession movements, the Vermont Republic and the successive independence movements in Vermont were less motivated by economics than political autonomy, ultimately satisfied by the admission of Vermont to the Union. There were other, less extensive, western secession movements; Aaron Burr’s little expedition down the Mississippi in 1806 could also be counted as one, although it may have been more a filibustering expedition than secession attempt. 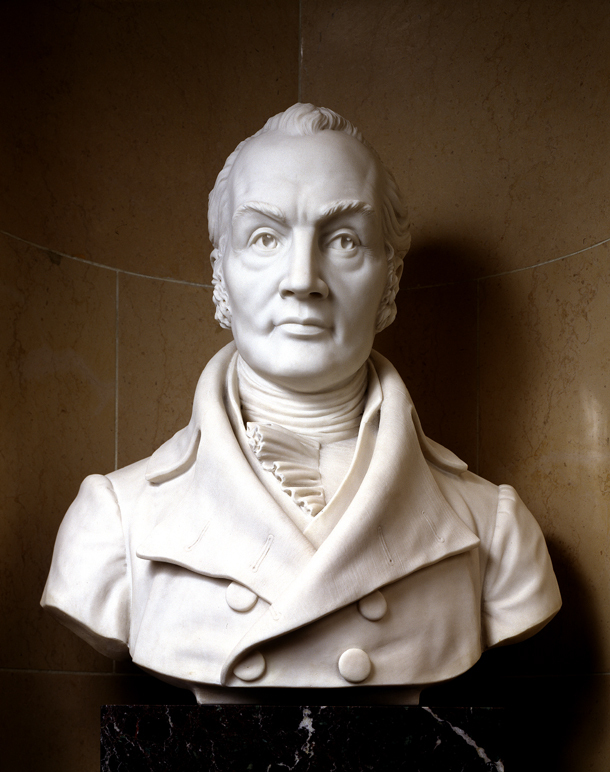 Aaron Burr was a hero of the Revolution and Vice President under Thomas Jefferson. In 1806, the ambitious Burr organized another western conspiracy, although what his actual intent was remains obscure. By one account, Burr was going to separate parts of the American South and Spanish Texas to form an independent country; by another, he was intending to grab Texas for the US; by still another, Burr, along with General Wilkinson, were to grab a large chunk of the American South and deliver it back to Spain—a newer variant of the original Western Conspiracy. What the truth of the matter really was has never been settled. In any case, Burr and his co-conspirators were up to something nefarious, although not proven in a court of law. The Western Conspiracies of the early Republic had nothing to do with the institution of slavery, but most of them had everything to do with regionalism and economic self-interest. Was the Civil War about slavery? Yes. Was it ALL about slavery? No! 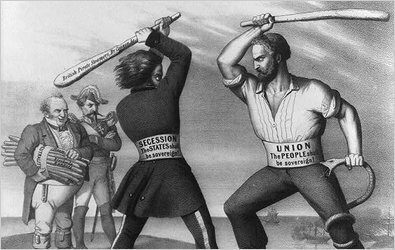 Modern political cartoon about Texas secessionists. For more about little known aspects of the Civil War, see Ghosts and Haunts of the Civil War and The Paranormal Presidency of Abraham Lincoln. Forthcoming later in 2016 is Ambrose Bierce and The Period of Honorable Strife, which covers the wartime career of the famous writer and the campaigns in the Western Theater in which he participated. 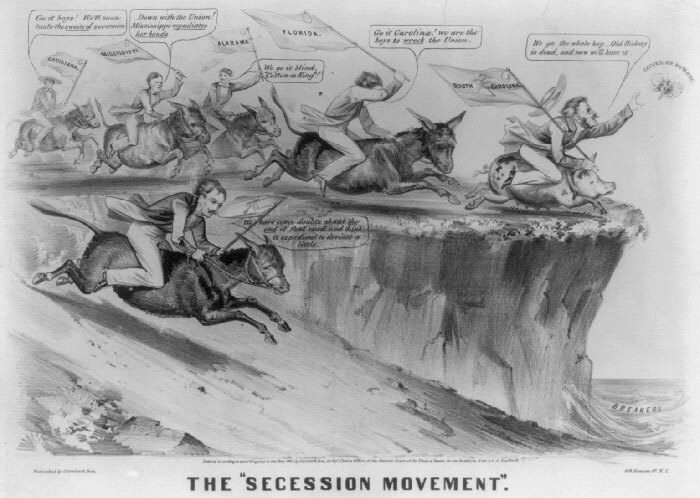 Political cartoon about the 1860 Secessionist movement.